You are here: Home / Book Reviews / Metal Cats Book Review and Giveaway! 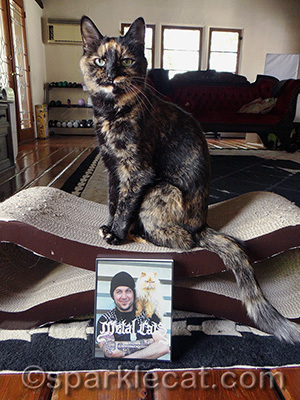 Metal Cats Book Review and Giveaway! This is my heavy metal expression. It’s important I have the right attitude for this book review! 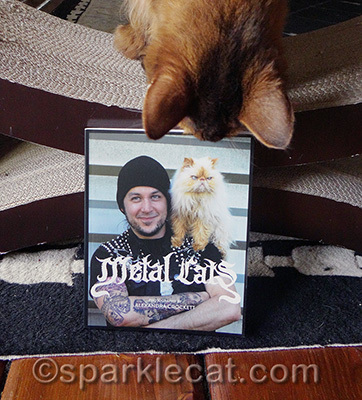 Metal Cats is a cool little book full of photos of cats… and the metal dudes that love them! I think most of you know by now that my human was a rock journalist for many years, and she specialized in loud music. So she was very particular about how we kitties posed with this book. As you can see, Binga failed because she was trying too hard. She looks like she is posing for a book called Hard Rock Cats. But this book doesn’t have poseurs in it. These kitties and their humans are the real, heavy deal! 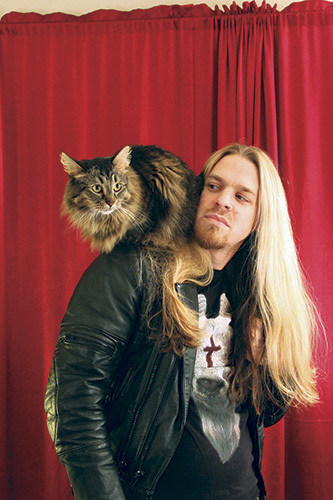 The whole concept came about when photographer Alexandra Crockett, who has been part of the metal scene since she was a teenager, was doing promo shots of bands and friends — and she realized what a great connection many of these metal guys had with their cats. Cats are metal, after all — we are nonconformists and rule breakers, and we don’t just question authority, we completely ignore it. Plus we’re charming. So it only made sense to put together a photo book that combined the raw power of cats with the powerful metal of these musicians. From Metal Cats by Alexandra Crockett, published by powerHouse Books. I am especially fond of the last photo because it shows that not only do metal guys take their cats to the vet when they need care, they are willing to put uncomfortable coverings on their heads in sympathy. ‘Cause that is what’s going on there, right? 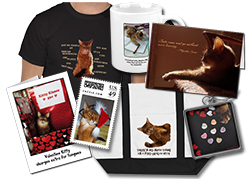 But I haven’t told you the best part of the book yet: a portion of the proceeds will go to cat rescues! So when you buy a copy, you are helping kitties! There will also be fundraising shows in the Bay Area, Portland, OR and Seattle! Plus a fundraiser/ book release party in Brooklyn. 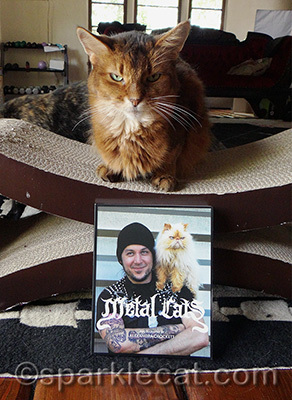 Metal Cats comes out May 6, and you can pre-order you copy on Amazon here. And in case you didn’t notice my headline, I’ve also got a copy to give away! I made arrangements with the publicist human to send it here so that once I was done posing with it, I could give it away to anyone in the world! That’s right, this giveaway is open to my international and U.S. readers! ‘Cause I know I have international readers who love both metal and cats! All you need to do is comment below and let me know you want to be entered! I will randomly choose a name at midnight on Monday, May 5! Good luck! Disclosure: Links to Amazon are Associate links, and I get a small commission for each sale… ’cause I deserve it! Please enter me, Iwould LOVE to have this book!!! Enter me please 😀 Thank you! I love loud angry music AND cats! What a great combo! I’d love to win this book! Hi Sparkle. I love Metal, Judas Priest and Rob Halford their lead dsinger are my two favorites. I would love to win this because it is cool and a very unique look at met and the gus that love their cats! 🙂 Thanks for the give away Sparkle! this book looks so kewl! Mom likes guys who like cats….says it says something that they don’t need 2 b chased an r patient wit all of our moods! MOLMOL!!! Oh Mum SO wants this – she knows our big brother (who lives in England) will love this book! Iff we don’t win we will buy him one!! 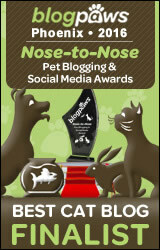 We want to enter the contest for the Metal Cats book! Our meowmie would really like it! She is “too metal for one hand” \m/\m/ MOL!!! 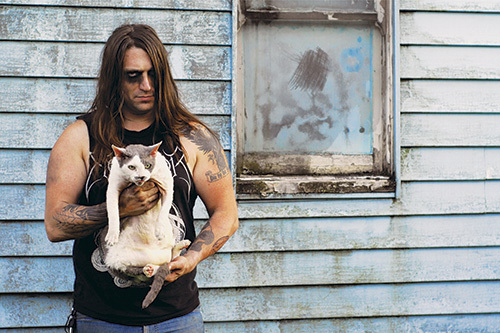 I think it’s great that these metal rockers are cat lovers also. To make a book like this including cats and then donating a potion of the proceeds to cat rescues is just awesome. Sometimes people forget that many cats need aid and forever homes and it cost a lot for shelters to take care of all those precious cats. Good job by everyone involved. Always love your pets.